AMITA's International Resources Recycle and Utilization Scheme | AMITA (English)｜Design a sustainable society. Due to globalization and industrialization, many countries are now facing various environmental issues. Due to rapid economic growth, infrastructure and regulations tend to be incompatible with real issues in many countries. This could result in further pollution and the depletion of natural resources. These are issues which Japan has experienced. 3) Purchasing by-products, residues and environmentally conscious products. Every year, a variety of wastes, residues and by-products are recycled at AMITA resource recycling plants. At our plants, they are turned into alternative raw materials and fuels and sent to final users such as iron, non-ferrous or cement industries. With our "blending" process, 100% of the collected wastes, residues and by-products are recycled. In other words, no secondary wastes are generated in our recycling process. For more information about our unique "blending process", please click here. 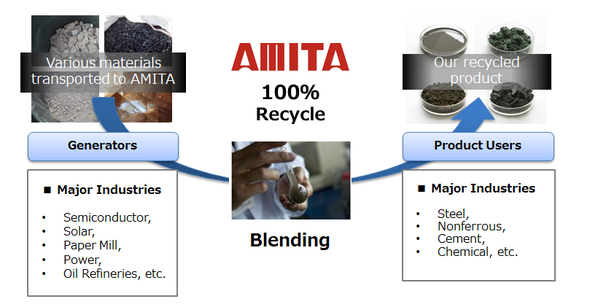 With its international network, Amita supply recycled products and by-products to various customers. It helps to match unutilized resources and our users internationally. Amita believes it encourage more resources utilization at competitive prices. Amita purchase your recycled products and by-products for our customers. It helps to match unutilized resources and its users internationally. Amita believes it encourage more resources utilization at competitive prices.